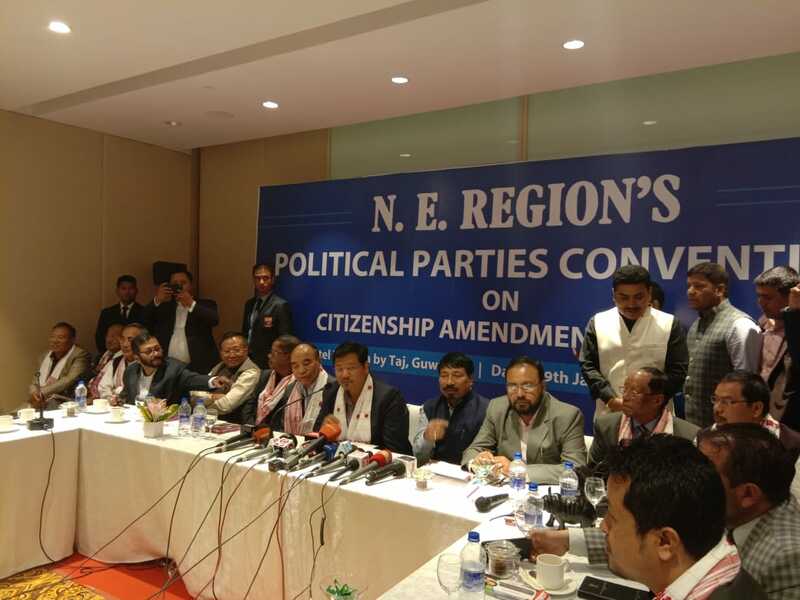 Constituents of NEDA participate in NE Regional Parties Convention on Citizenship (Amendment) Bill in Guwahati on January 29, 2019. Less than three years after its formation, the BJP-led non-Congress forum, North East Democratic Alliance (NEDA) is facing a tough challenge courtesy Citizenship (Amendment) Bill, 2016. At least eleven political parties in seven states of the region, some of which are parts of NEDA, have on Tuesday took part in a political conclave and adopted a strong resolution against the Citizenship (amendment) Bill 2016, the contentious Bill the BJP has been pursuing and has already got passed in the Lower House of the Parliament. NEDA was formed in 2016 after the saffron party emerged victorious in Assam Assembly polls. Following the formation of the non-Congress forum, different regional parties joined the BJP-led forum in the region which finally helped the BJP gain ground in the region and saw ouster of the Congress from power in all the states in the region. The members of NEDA who took part in the conclave today included National Peoples’ Party (NPP), Mizo National Front (MNF), Asom Gana Parishad (AGP), Naga Peoples’ Front (NPF), Nationalist Democratic Progressive Party (NDPP), United Democratic Party (UDP), Indigenous People’s Front of Tripura (IPFT), People’s Democratic Party (PDP), KHNAM, Hill State Peoples Democratic Party (HSPDP) and Janta Dal (United) . The development assumes significance as the protests against the Citizenship (Amendment) Bill 2016 has been growing louder in the region particularly after the contentious bill has been passed by Lok Sabha on January 8. “We have taken a strong resolution against the Citizenship (Amendment) Bill 2016 today. If the Bill is implemented it will be dangerous and harmful to the people of the region. So we unanimously decided to oppose the Bill,” said Mizoram Chief Minister Zoramthanga while addressing a press conference on Tuesday after the convention. The Mizoram Chief Minister during his speech in the convention also suggested to the members of the convention to come out of the BJP-led National Democratic Alliance (NDA), if the demand for scrapping the contentious bill is not paid heed to. “We have decided to send a delegation to meet the Prime Minister and President of India to scrap the Bill. We hope that the government of India will understand the sentiments of the people of the region over the Citizenship (Amendment) Bill 2016,” said convener of the convention and Meghalaya Chief Minister Conrad Sangma while adding that the parties would soon work out a strategy if their demands were not paid heed to.